A flaneur is a stroller, a loiterer, someone who ambles through city streets in search of adventure and fulfillment. Edmund White, who lived in Paris for sixteen years, wanders through the streets and avenues and along the quays, into parts of Paris virtually unknown to visitors and indeed to many Parisians. In the hands of the learned White, a walk through Paris is both a tour of its lush, sometimes prurient history, and an evocation of the city's spirit. 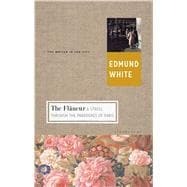 The Flaneur leads us to bookshops and boutiques, monuments and palaces, giving us a glimpse the inner human drama. Along the way we learn everything from the latest debates among French lawmakers to the juicy details of Colette's life. Edmund White is the author of three memoirs, My Lives, City Boy, and Inside a Pearl, about Paris. His many novels include the autobiographical A Boy's Own Story and, most recently, Jack Holmes & His Friend. He is also known as a literary biographer and essayist. White lives in New York and teaches at Princeton University.